Butterfly Weed – Nectar of the Monarchs | Faddegon's Nursery, Inc.
Jun 16, 2016 | Perennials, What's New? It’s a very daunting prospect when we hear about so many global problems, to think about how we can help. Don’t we all feel overwhelmed sometimes? It’s a happy thing to find a small gesture we can contribute that has a lasting effect. Planting some butterfly weed is one of those gestures. Monarch butterflies work very hard to stay in existence. Their migration is celebrated all over the Western hemisphere. As children, it’s one of the first fauna of the outdoor world that we learn to identify. But their world is fragile. What can we do to help? Plant some butterfly weed (asclepias tuberosa), a species of milkweed. It is one of the Monarch’s favorite nectar sources and a native plant of the Northeast. As gardeners, we make many decisions each spring and summer about what to plant, what to remove and why we want certain plants. Putting butterfly weed at the top of your list this year will help to ensure the Monarch Butterfly survives and that your garden stays beautiful. Those are good enough reasons for me! Butterfly weed is a long-lived and long blooming perennial flower. Blooms begin in early summer and continue, with deadheading, until early fall. 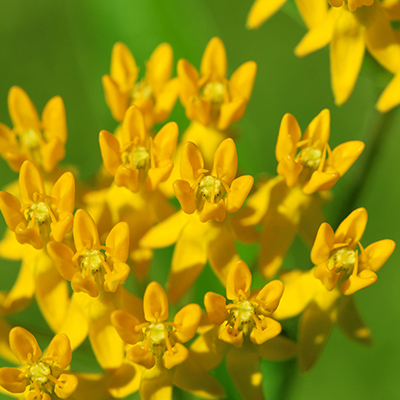 The typical orange variety is native to prairies and meadows of almost all of the U.S. Yellow butterfly weed is a newer cultivar showing very bright yellow through the season. Later fall brings those familiar seed pods that open to release a flutter of seeds. Along with Monarchs, other pollinators will be attracted to this flower. Queen butterflies, hummingbirds and Grey Hairstreaks will be grateful to find this plant. It’s known for its abundance of nectar! Deer will ignore butterfly weed except in times of severe drought.